The Centre of Culture Promotion „Gaude Mater” is hosting an international exhibition competition for its 10th Biennial Of Miniature Art – Częstochowa 2018. The exhibition has competitive character. It is open to professional artists and students of Art Academies — Bachelor of Fine Arts is required. Jury selected by the organizers will award a Grand Prix and money awards, as well as honorary awards. All artists qualified to participate in exhibition will receive the official exhibition catalogue. Every artist may send three works in one of four techniques: painting, graphics, drawing, monochromatic photography. The starting point is the size of the works – it cannot exceed 10×10 cm. 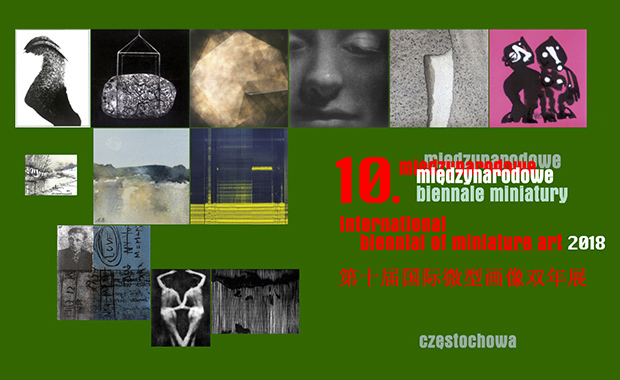 The Biennial takes place every two years in Czestochowa, Poland. The beginnings of the competition date back to 2000. The 2018 exhibition opens on 25 August 2018 and is planned to be shown in other Polish cities, in addition to Czestochowa. The participation fee is 40 Euro, or $50 (USD).